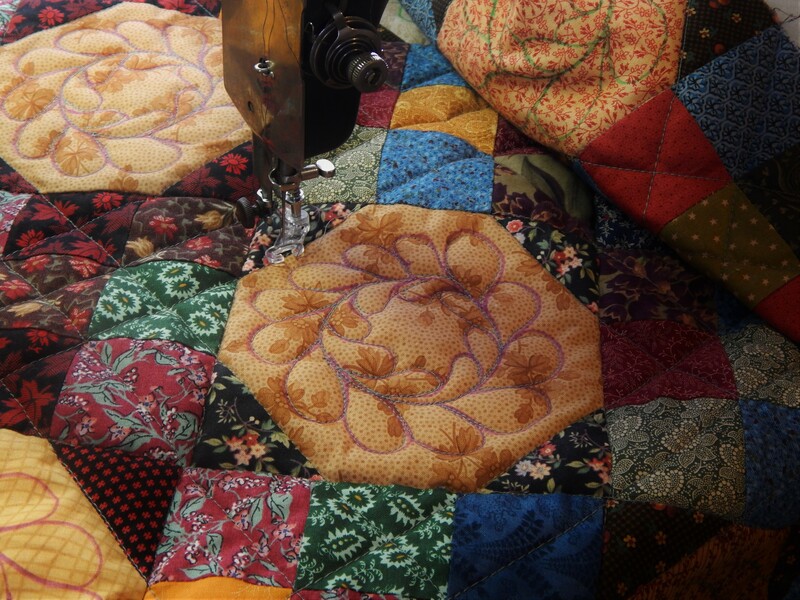 I mainly collect quilt tops (vintage and antique), and hand quilt some of them as time permits. Once quilted I use them, and keep them. I also use the unquilted tops for lectures, to demonstrate about designs, styles, construction, fabrics, planning the quilting, repair, etc. Occasionally I will hand quilt a project for a friend. I have an exciting friend protect that I plan to start in the new year. This beauty is in perfect condition except for a bit of dirt. It’s corners are cut out to fit a poster bed as was common in antique quilts. I would not want to add corner pieces to it because even though it is how we make quilts now I want to keep it as close to it original intent as possible. I love the design, the colors, the fabrics, the boarders ….everything about it just makes me happy. I am looking forward to getting to work on it. 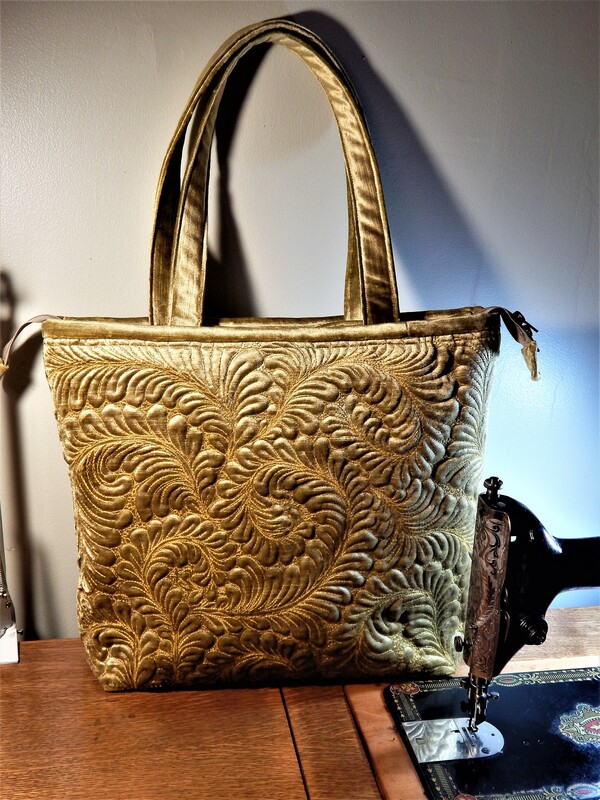 I want to do this justice by quilting it as much as I can like it would have been quilted in the era it was made. 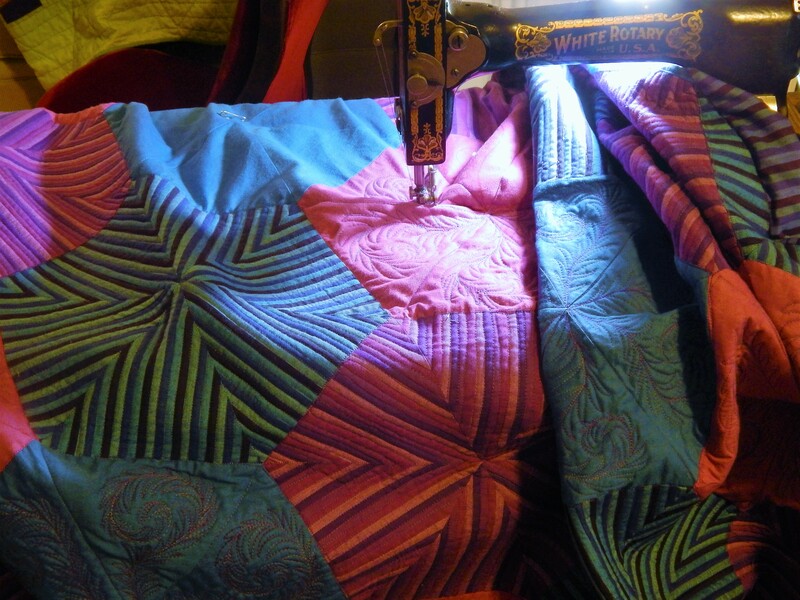 Here is an example of the kind of dense quilting that I plan for this. I will be using a thin cotton batting and a muslin backing to match the front. I will post progress along the way when I get going on it, but I thought you might like a teaser of things to come. 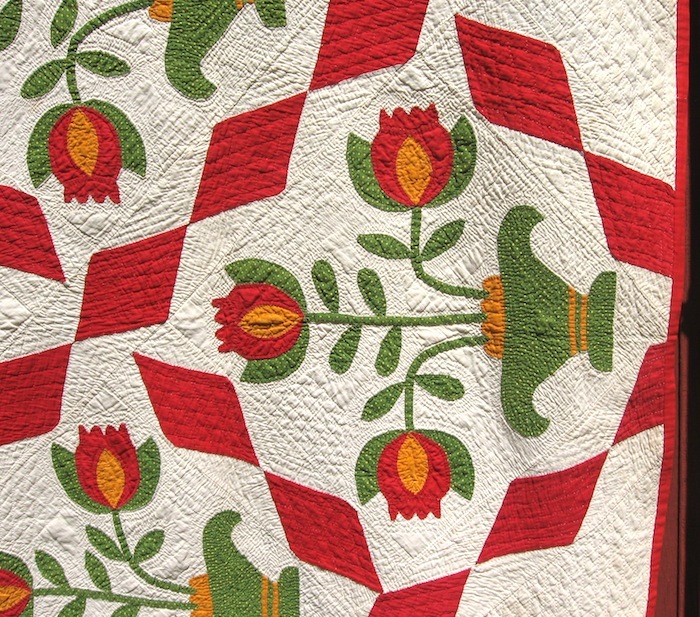 This entry was posted in Quilts and tagged antique quilt top, hand quilting, Quilts. Now that is gorgeous! I know you will do it justice. I can’t wait to see it come together. Thanks for sharing. It is a beauty!…I cant wait to get working on this!! I like todays’ featured quilt. Will be looking forward as you finish it. ALSO, I love all the people on your tree! Merry Christmas. Wow! This is going to be beautiful. Can’t wait to see your progress. I feel lucky to be able to work on such a beautiful quilt top! we have 5+ inches of snow forecast for tonight….! Ok, if the friend doesn’t like it when you are done, can I be the next friend in line? I understand how you can hardly wait! it is tempting to start now! WOW…this one is spectacular! It will be even more so when it’s quilted. Are the edges for the corners raw? I am wondering if it was deliberately constructed that way because the maker had a particular bed in mind. Sometimes coverlets are made this way. Glad it will be finished now. I want the snow to go away too! but have fun on the count and stay warm! A teaser indeed!! What an incredibly beautiful top. I know your quilting will do it justice. I look forward to following along! That’s a beautiful quilt top. I look forward to seeing your progress. Thank you for sharing such a wonderful quilt with us. Look forward to seeing more of your beautiful work. That will be a stunner when you finish it. what a great top to get to quilt! What a wonderful way to start out the new year! I always look forward to seeing what you have planned for you next project. You and Teddy have a very Merry Christmas and a Happy New Year! Sometimes, when I’m scrolling down on the WordPress reader I don’t see the bloggers names, especially if I’m scrolling quickly. Most of the blogs I follow are either science of quilting/sewing blogs however, I can tell a Tim Latimer post at a glance. What you you say is the age of the quilt top? This will be a joy to watch as you bring it to its’ fullest beauty. The maker would be proud you will honor her with your stitches. Lovely appliqué. 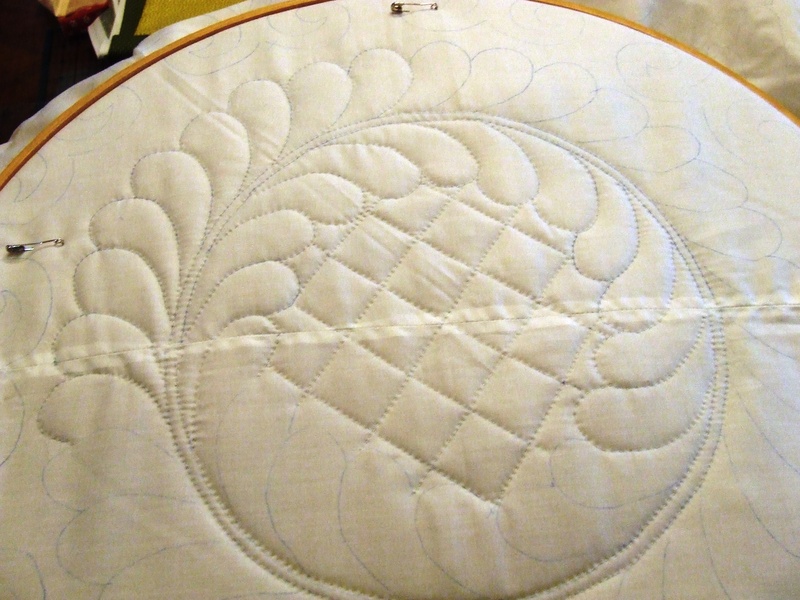 Have you quilted many appliqued quilts before? I can’t wait to see your super quilting on this beauty. Tim This quilt is just gorgeous!!! The colors are so beautiful and I can’t wait to see it all finished!!! Thank you for posting your lovely work!!! I hope to get back to my sewing, quilting and other needlearts after the Christmas Holidays!!! Winter is upon us and there is nothing more enjoyable than snuggling in and creating with our hands and minds and giving to those we love and also keeping many of those creations to pass down to future generations. This is especially interesting to me as I just found a variation of “Rose of Sharon” in pinks in an antique shop. The sewer put it all together by hand and mitered the corners. I soaked in in Orvus and all the yellow tinge came out of the muslin. I can hardly wait to hand quilt it! Thanks for the illustration above showing the dense quilting. I originally thought I would echo quilt, but now I think an overall, denser pattern would be better.